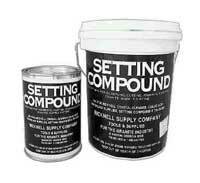 Setting Compound is the only grade needed for use during any season. Keep container sealed and store in a cool place for contents to remain pliable. Four colors are available in gallons and quarts. This product is not an adhesive. White Nylon Poly Stone Handling Webbing that has a cotton face on the inside. 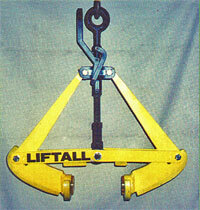 5' Hanging Length is the most common size/type used. This is for a pair of slings only; the yoke must be purchased separately. 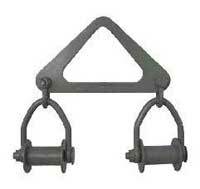 It is a "continuous Loop Sling" which is endless by an overlap joint. 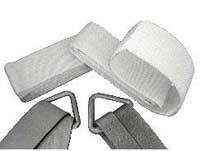 A pair of 4" heavy-duty slings has a safe work load of 8,000 lbs. Tagged OSHA approved when you receive them. Width is 15" between center of the slings. Made for slings up to 4-1/2' wide. Slings not included. Weight 34 lbs. 1" Diameter - 4 Roller. This style has a frame built over the top and is sturdier than in the past although it does need an additional 4" for clearance. About 32" long made for slings up to 4-1/2" wide. Slings not included. 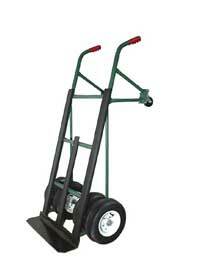 Monument Liftall Capacity 2500 lbs. Weight 47 lbs. For monuments only, 3-1/2" to 15" thick. Rubber squeezes out through plastic cushions; monument will drop in the hold about 1/8" as it grabs it. THis works with almost any stone except Chinese Black because of the coating. Ships UPS. One man can pick up memorial for removal and transport to enable fill in or leveling. Set tongs 3" from edges of base and top on turf with rawhide maul for no damage to turf. Self adjusting tongs fit most bases. Tires included. American Cemetery Supplies is a full service source for Burial Vault, Cemetery, and Funeral Home companies of all sizes, supplying all essential death care industry needs. As a team we are committed to customer satisfaction regularly monitoring cost of goods along with overhead to provide the lowest possible price in the industry. © 2004-2005 AMERICAN CEMETERY SUPPLIES, INC.